Before meeting Marley, we didn’t have any hands on experience with Tennessee Walkers. As Marley has progressed in his training and totally won us all over, we’ve become big fans of the breed. 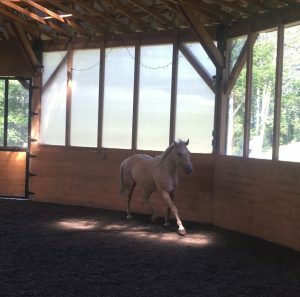 Marley’s ancestors originated in Tennessee, where Narragansett and Canadian Pacers from Kentucky crossed with gaited Spanish Mustangs from Texas to create 'Tennessee Pacers.' Prized for their smooth gaits and calm dispositions, these sure-footed horses were originally used on farms and southern plantations. 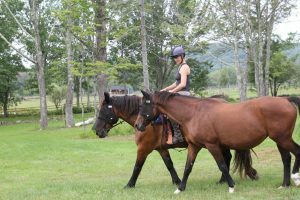 Tennessee Walkers are best known for their ‘running walk,’ which Marley naturally does under saddle. Their other main gaits are the flat walk and canter, and we’ve seen Marley trot and pace as well. While Tennessee Walkers are often associated with dramatic movement in the show ring, they also make wonderful pleasure and trail horses. In competition, Tennessee Walkers are shown in two basic categories, "flat-shod," (with regular shoes and a more natural way of going) and "performance" (where layers of front hoof pads known as "stacks," and other weighted devices create the high-stepping "Big Lick" style). This controversial form of shoeing is now prohibited at many shows. Tennessee Walkers are the breed most affected by the Horse Protection Act (HPA) of 1970 which prohibits the practice of 'soring.' 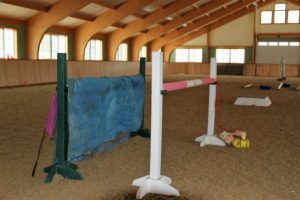 These abusive practices inflict pain in the legs to help create exaggerated gaits in the show ring, and can still occur today despite the law. 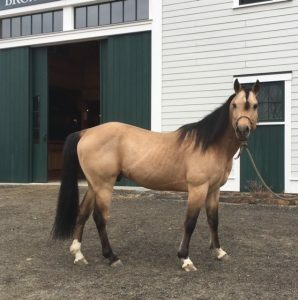 With his relaxed, friendly demeanor and unique gaits, Marley is a great representation of this versatile breed. We love just watching him cruise around in the arena, and he makes us laugh everyday with his antics. 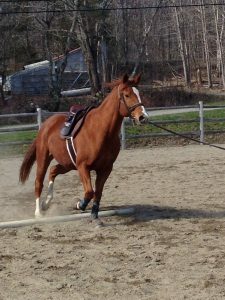 Marley has begun work under saddle and has worn both English and Western tack. 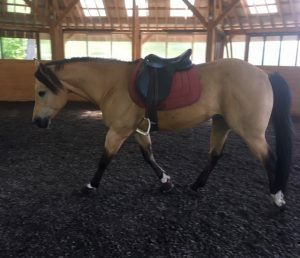 Those gaits really are comfy to ride, and with continued training we’re sure that Marley will make someone a lovely pleasure and trail horse. We look forward to seeing his progress, and are thrilled to have gotten to know this wonderful breed. 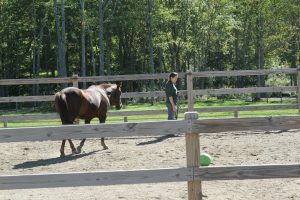 Here at the farm we use a variety of obstacles to help our horses gain confidence and to expose them to as many objects as possible. 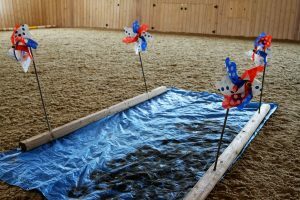 They are also a very useful way to simulate what the horse will encounter out on the trail, such as streams, bridges, and fallen trees. 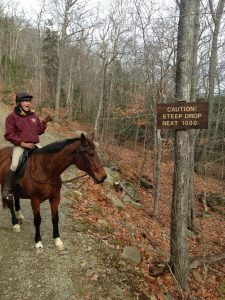 Desensitization to such things as flapping tarps and plastic bags is critical to a safe trail riding experience. We also have our horses walk through a collection of empty plastic bottles, cans, and coffee canisters--debris that sadly are all too often found on trails. We even have an old mattress (and we all know those discarded mattresses are terrifying)! 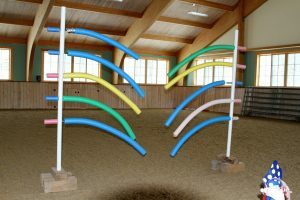 The "car wash." This type of obstacle helps the horse become accustomed to squeezing through a narrow area, as well as to the feel of the noodles against his side. 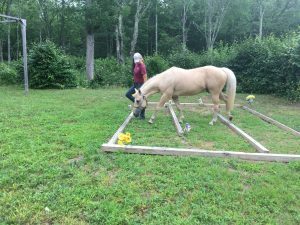 Additionally, with imagination and only a little effort, you can construct obstacles that resemble the confines of a trailer--thereby laying the groundwork and gaining your horse's trust when you ask him to go through or step onto something. 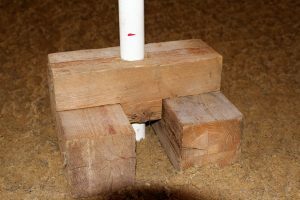 The base should be sturdy so it is difficult, if not impossible, to knock over. Another use for poles, standards and tarps. 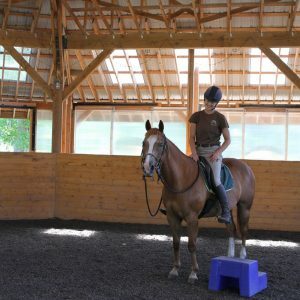 When introducing your horse to these things, it is important to use approach and retreat. Ask the horse to walk by the object at first, in both directions. Start from farther away and gradually approach the new object. When he seems comfortable doing that, allow him to approach and investigate if he wants. Reward the slightest try by walking away, then approaching again. If he is trying to do as you ask, don't push him to try harder; wait, retreat if necessary, then approach again. Think of it this way: if you were afraid of heights, and someone forced you to climb to the top of a ladder, this would only serve to worsen your fear and anxiety (and you'd probably start to dislike that person). However, if someone coached you to just begin with one step and progress in stages as you felt more comfortable, you'd begin to conquer your fear much more effectively. The same approach works wonders with horses. 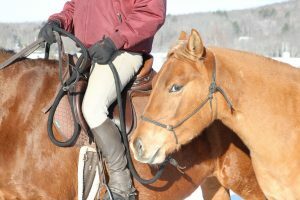 It is important to watch for signs that the horse is letting go of tension when in this process. 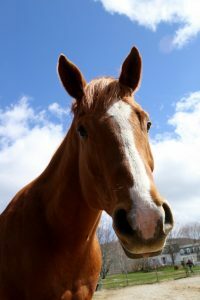 Things such as blinking, licking, chewing, sighing, or shaking the head and neck indicate the horse is coming down off adrenaline. These signs of relaxation may be obvious or very subtle, and you may have to wait quite a bit of time before you see them. Waiting for these signs is critical because a horse cannot learn when he is in a fearful, reactive state of mind. If you put enough pressure on a horse then, you might force his body to move but he would not be thinking or accepting, only reacting---which may cause him to be worse next time. But if you give him enough "soak time," you will teach him to think through "scary" situations and to trust that what you are asking of him is not going to hurt him. This is the beginning of that special bond we all desire to have with our horses. Jake going through the vertical "car wash."
Horse rescue is a multi-faceted endeavor. Sometimes the equines are in dire need of critical and supportive care just to get them out of physical crisis. The work and dedication doesn't stop once they are healthy, however. We need to begin building up their strength and stamina before their bodies, minds and emotions can handle any focused training program. This is crucial preparation that enables them to be successful in their new homes once they are adopted. A prime example of this approach is what we did with our older mare Cassiopeia. 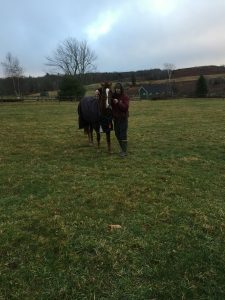 Once we addressed her ailments, we began getting her back into condition by ground-driving, long-lining, and round pen work, which served the dual purpose of showing us how much she knew. We also ponied her off another horse on short trail rides. We did this for a few months before ever getting on her back. 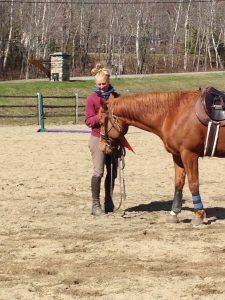 Once we had progressed to riding her in an arena, we began trail rides incorporating gentle hills. This hill work, which was all done at a walk, continued to build muscle along her back and in her hindquarters. 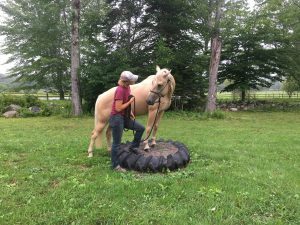 It taught her to round up into her back and carry herself in a biomechanically sound way, which in turn helps support her joints. 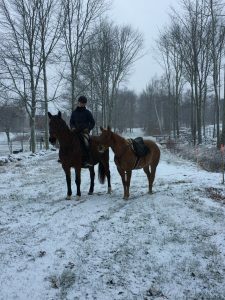 But riding out (or hand walking your horse on the trail) has many other benefits as well---it enables the horse to move out and gives both horse and rider a nice change of scenery. 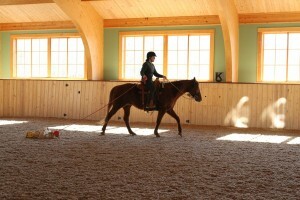 It also builds mental and emotional fitness in the horse, creating a wonderful all-around partner. Being out on the trail is a wonderful opportunity to be "in the moment" with your horse, and to connect with nature. 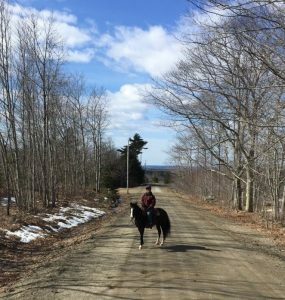 Not too long ago one of our trainers was out with a horse on the blueberry barrens above the farm. That place, she said, was "magical," and she recalled seeing a snowy owl up there. But not everyone has access to trails or property to ride out on, and maybe not even anything resembling a hill. Not to worry. We like to use poles, barrels, or logs that are no higher than 18 inches. We ask the horse to go over them on circles and straight lines, usually starting out on a long line. 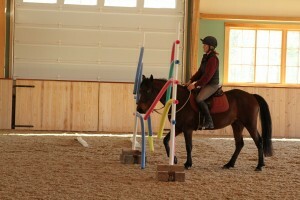 Depending on the fitness and health of the horse, we may then progress to navigating the obstacles while riding. 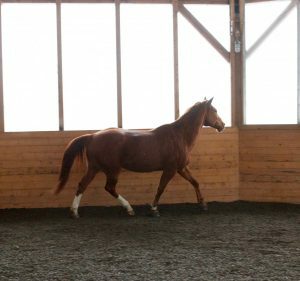 Walking through a cavaletti grid is better for older horses with swayed backs, as it encourages them to stretch their backs and use their toplines. If riding out on hilly trails, zigzag instead of going straight up or straight down. 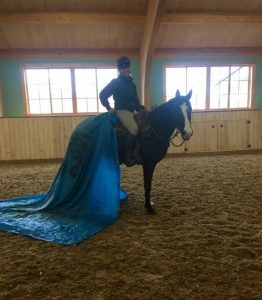 And, when hand-walking, asking your horse to back up a slight incline really gets him to tuck his hindquarters underneath himself. Start out with just a few steps at first, gradually working up to longer stretches within reason. Keep in mind, of course, that your horse needs to be sound to begin this. Check with your veterinarian if you are unsure or if your horse has any problems or discomfort. We incorporate bodywork whenever necessary and any supplements or treatment the vet may recommend, such as for joint problems or muscle stiffness. We try to resolve any physiological issues before beginning a conditioning program. 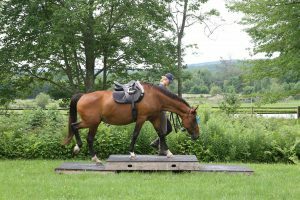 For more detailed examples of conditioning programs and correct spacing of cavaletti grids and trot/canter poles, search the Web or any online equine library. Ground driving continues to be a great way to keep Cassie in shape. We ponied Cassie to help build up her muscles before asking her to carry a rider. Here, Cassie is being asked to use her body correctly on a circle. Cassie on the Camden Hills State Park trails. If you spend time observing a mare and her foal, you’ll see the foal mirroring every move its mother makes. It will be stuck to her side as if still attached by the umbilical cord. It is a beautiful thing to watch. Besides the period of bonding that occurs shortly after birth, the foal is born with an instinct to follow—be it its mother or another herd-mate. Through this, the foal learns about its environment and gains confidence from its mother or pasture/herd mates. This is a concept that is often used during training. Being with an older, calmer horse gives the young or green horse a sense of safety and security. Pebbles, our three-year-old, has greatly benefited from this practice while she learned what we expect from her. 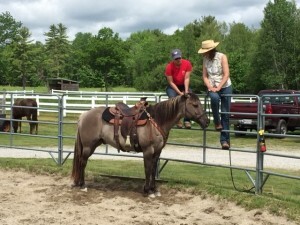 We have been getting Pebbles accustomed to different types of gear, and observing things out of both eyes while learning to stand to be saddled. We've also been teaching her to move out freely and change direction with her tack on. Then, we started ponying her off Cassie on short trail rides, and when she became worried or insecure she found comfort in another horse being close and moving out with her. This has helped her become comfortable traveling over varied terrain while slowly building her fitness. Cassie, being an older, seasoned horse who has become confident on the trail, is the perfect surrogate mother for Pebbles. 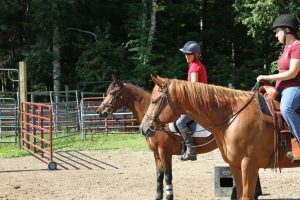 She is teaching her about the wide world and helping her become accustomed to the sight of a person up above her, as well as riders and horses behind her. All of these experiences are preparing Pebbles to be a steady, confident partner for her humans. We've all seen those 'Horse for Sale' ads that read: "So gentle children can handle." However, sometimes it ends up that the only people who can handle the horse are children. The horse refuses to let any adult into its airspace. Why is this? Both children and horses live completely in the moment. They are not burdened by past mistakes, worries about the future, or running around with a list of things to accomplish before day's end. We adult humans tend to be very direct-line in our thinking and actions and our horses pick up on this energy. They are also very perceptive to our intent. So, if we're distracted, worried, or carrying around residual emotions from the day, how is the horse to know it is not directed at him? Similarly, if we are approaching the horse with a focused, 'get it done,' attitude, this can be perceived as aggressiveness. 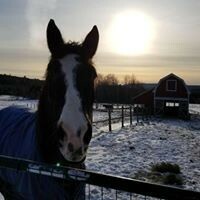 One of our rescue horses, Jake, was especially sensitive to changes in our energies and intent. He was also less inclined to trust men than women. 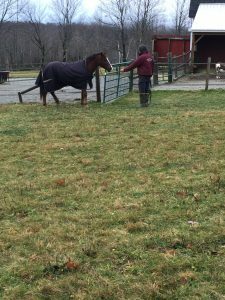 There are several things you can do to help a horse like Jake through this. Simply spending some undemanding time can work wonders, and the less focused you are on the horse, the better. Go sit in or outside of your horse's paddock or stall and read a book. Reading a book can make a difference because your thoughts are not focused on the horse; your attention is on what you are reading. Horses are so perceptive they can notice the difference, even if you are sitting there not even looking at him. They are that finely tuned to nuances and focus in our body language. 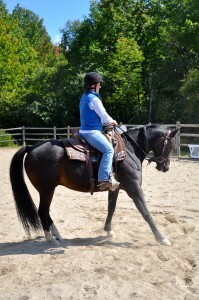 Once you do begin to approach your horse, do so in a wide arc towards his head. 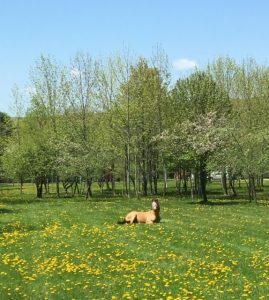 Don't sneak and don't approach him from behind or from the side--this is how predators approach their prey in the wild (and horses are, after all, prey animals...and we humans are the ultimate predators). Walk casually and have the attitude that you are approaching a much-loved friend or family member. 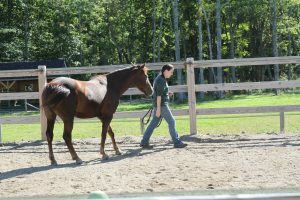 If your horse turns or walks away from you, you walk away too in the opposite direction; then start again. You can even begin walking a series of tracks back and forth in front of your horse, instead of approaching him directly. 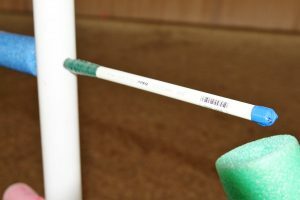 Pretend you are looking for a lost shoe or halter; this takes the pressure off your horse and will bring his curiosity up. As you can see, Megan is at an angle to Jake and is not focusing on him. Jake heads over to investigate as Megan glances at him over her shoulder, still keeping her body facing forward. As Jake approaches her shoulder, Megan begins walking again and Jake follows along with her. Harmony achieved! Once you can approach your horse, begin by just walking up to him and putting out your hand for him to sniff it; then immediately walk away. You can also just visit to give him a treat. 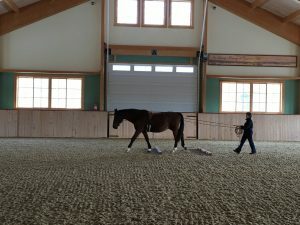 From there, as often as you can, go out to your horse, put his halter on, give him a treat (you can omit the treat if you wish and it will be just as effective), then remove his halter and walk away. We did this with Jake several times a day and this hard-to-catch horse was soon walking up to anyone who approached him. Then came the acid test: we had Caleb, who had not been able to approach or halter Jake previously, go out to see if all this practice would result in a successful catching and haltering. It was a smashing success, especially considering that Jake had been in the stone-dust paddock all day and the grass was an enormous temptation. A quick word about treats: some people say never to use them as this is just bribing the horse (and of course if the horse is or becomes mouthy, you wouldn't want to treat until you've established a solid foundation of respect). But for the skeptical horse, it can be a gesture of goodwill--just as when you bring baked goods or a bottle of wine to a gathering. It establishes you as a source of good things. Think about it from the horse's point of view: exactly what is in it for him to do our bidding? He'd much rather be out grazing with his buddies. But if we can establish ourselves as trustworthy, consistent, and the bearer of good things, it will go a long way towards growing a bond that will create in the horse a desire to be with us. Caleb approaches Jake head-on, and offers his hand for Jake to sniff. 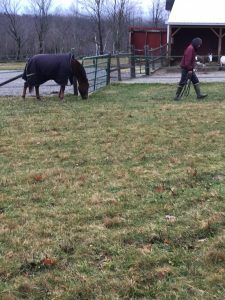 Jake allows Caleb to put his halter on and he is given a treat as a reward. This is actually the first time Caleb has been able to halter Jake. With his good looks and laid-back attitude, Charlie was one of the first horses to catch our eye at the New Holland auction this past December. Upon completion of his quarantine, we began evaluating Charlie and determined that he had soundness issues which needed attention. Several months later, we now have a clear understanding of Charlie's needs and have begun the retraining process. Charlie has been diagnosed with Navicular changes in his front feet. This means that the navicular bone within the hoof has slight damage which than affects a horse's soundness. Often, corrective shoeing alone can alleviate the discomfort and allow the horse to lead a useful life, and so we put front shoes with a 3-degree wedge pad on Charlie. These help take pressure off the heels, and allow Charlie to distribute weight evenly across his front hooves as he moves around. Our vets also gave Charlie an injection similar to that currently used in Osteoporosis patients, which promotes new bone growth. Lastly, he received a coffin joint injection to help calm down any inflammation in his hoof. 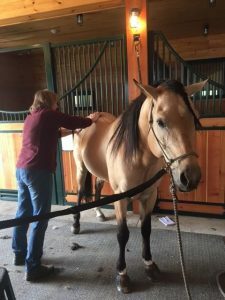 Charlie has also received several massages, as he had tight muscles from over-compensating throughout his body when his front feet were very sore. Now that we have addressed these issues, we have received the green light from our vets to begin working Charlie under saddle. 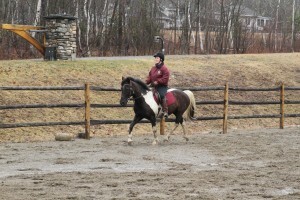 We had previously done obstacles, work in the roundpen and on the lunge. Charlie has been great for the vet and farrier and clips, ties, bathes and trailers well. He is an easy-going guy with a slightly goofy but definitely sweet personality. 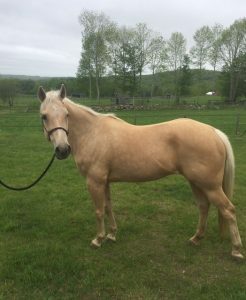 He is very sociable and loves to play with other horses in turnout, but is also independent and does not rely on them for stability. Thus far Charlie has been a gentleman under saddle as we have begun gently legging him back up for riding. 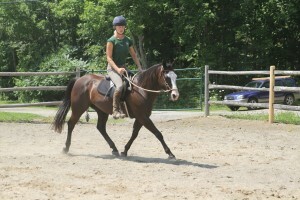 At this point we have walk/trot/cantered in the ring and have just begun taking him out on the trails. 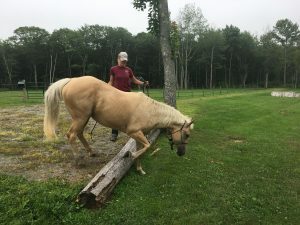 He will have physical limitations, and ultimately will need a low-key home as a pleasure and trailriding horse. We'll continue to monitor Charlie closely as we increase his work and expose him to new situations, and look forward to continuing his training. Stay tuned for more updates on this handsome boy! A teacher asks her student a question: what day is it today? The student responds with confidence, "It's Friday!" Again the teacher asks what day it is, and this time the student hesitates before saying, "The 7th?" Again the teacher poses the exact same question, and the confused student replies in frustration, "I don't know!" 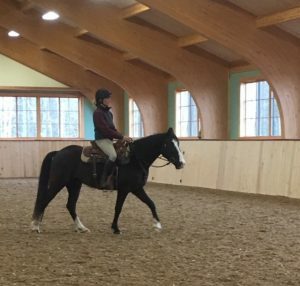 This little story is a helpful reminder for any educator, and applies perfectly to training horses. Through failure to acknowledge a correct response (while continuing to repeat a question in the same way) this teacher quickly lost the confidence and good will of her student. As we work with our rescues, we have to be as clear as possible in every session. Huge praise when they try to answer our questions and a quick, clear correction for undesired behavior is what allows the training to progress. Initially, if a horse even thinks about trying to do what we ask then we immediately reward that effort. 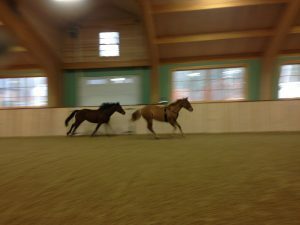 Once they understand that the release of pressure is a reward for desirable actions or behavior, horses will seek to find the comfort of that release again. Likewise, if a horse is behaving in an undesirable way then we must make the correction, but follow up immediately with a clear contrast. 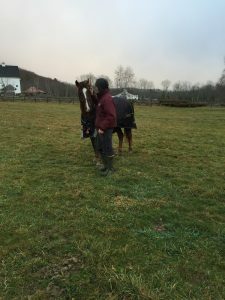 It can be tricky not to get swept up in the heat of the moment, but it is crucial to reward, release all pressure, and carry on normally as soon as the horse responds to our request. We might have to make the correction a hundred times, but that's just part of the process. As trainers, we must remember to always give a horse the chance to try again. It's a bit like giving directions to someone who is lost: they will want to know exactly when and where to turn so that they can reach their destination safely. If you say, 'oh, just turn wherever you want...' that's not helpful. Everyone wants clarity, and as flight animals horses take real comfort from knowing exactly where they stand. By being as clear, consistent and encouraging as possible, we give ourselves the best chance of creating confident and willing 'students' in our rescues.